St. George slew dragons that terrorized people; this George slays the Poverty-consciousness that makes most Filipinos wallow in penury and misery. This George wields no swords, but spreads words of wisdom. This New Thought crusader fights the superstitions and the dogmatic beliefs that have impoverished people’s bodies, minds and souls for ages. Son of business mogul Carlos Moran Sison and socialite Priscilla de la Fuente, multi-talented George tried his hand at various things – astrology, business (handicraft exports), stage acting (Avellana’s Barangay Theater Guild), teaching (Philosophy at FEU), painting (three one-man shows), poetry writing (three books), songwriting (Pilita Sings George CD album, What Name Shall I Give You My Love?- recorded by The Platters), film producing (Ishmael Bernal’s first film Pagdating Sa Dulo), column writing (at Weekly Graphic, for which he was detained at the start of Martial Law ), TV talk-show (Manila After Dark with Gloria Diaz) – but did not find fulfillment until he established his very own Temple. “With the New Thought, there is the realization of the Power Within, which brings happiness and fulfillment,” says George. “And the Temple is a process of sharing this joy with others,” he adds. 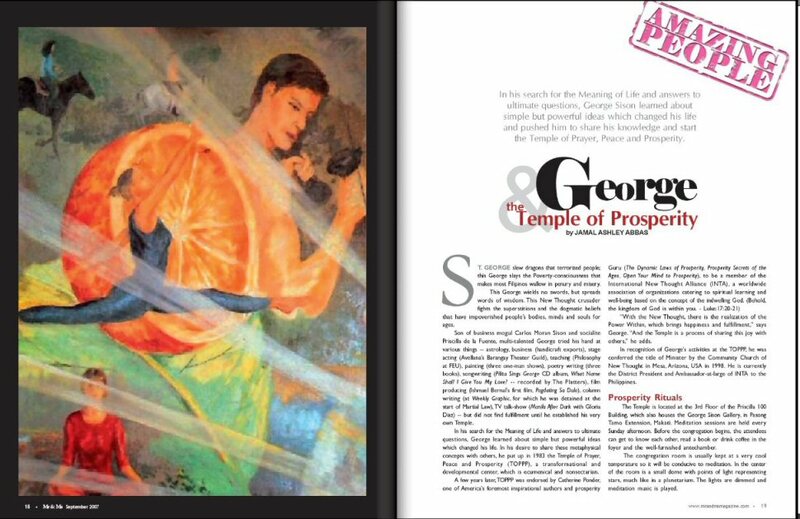 In recognition of George’s activities at the TOPPP, he was conferred the title of Minister by the Community Church of New Thought in Mesa, Arizona, USA in 1998. He is currently the District President and Ambassador-at-large of INTA to the Philippines. The Temple is located at the 3rd Floor of the Priscilla 100 Building, which also houses the George Sison Gallery, in Pasong Tamo Extension, Makati. Meditation sessions are held every Sunday afternoon. Before the congregation begins, the attendees can get to know each other, read a book or drink coffee in the foyer and the well-furnished antechamber. The congregation room is usually kept at a very cool temperature so it will be conducive to meditation. In the center of the room is a small dome with points of light representing stars, much like in a planetarium. The lights are dimmed and meditation music is played. by the group. In the middle of the session, a person stands and loudly affirms for himself / herself. The group then echoes the affirmation for that person. And then there’s a 15-minute or so intermission where the TOPPP members write down their “decrees” (requests for specific desires) in the Will Your Fortune sheets. The decrees are in the form of affirmations for themselves and their loved ones in the four areas; namely, Health, Success, Love and Wealth. George then gives a lecture on a specific topic. Afterwards, a staff member goes around carrying a bunch of collages the size of an old LP album. The member asks a question in his/her mind and picks up a collage. This is a form of divination based on the principle of Synchronicity as propounded by the pioneering psychiatrist Carl Jung. This is followed by more group and individual meditation. At the end, the group stands in circles and sings inspirational songs while swaying to the rhythm of the music. They call themselves TOPPPers. They come from all walks of life, from the financially challenged to millionaires, from ordinary employees to top executives, from fans to movie stars. Dina Bonnevie, Derek Dee, Marissa Delgado, Juan Rodrigo, Ernie Garcia, Lirio Vital, and Dexter Doria are just some of the actors who have become members of TOPPP at one time or another. Berna Martin is familiar to all Temple adherents. She joined the Temple staff in 1991 and found happiness there. “As a graduate of psychology, I find that attending George’s lectures is just like learning more psychology,” she says. “Also, as Mr. Sison told us recently, the Temple is like a ‘spiritual gym’,” she quips. According to Berna, before she came to the TOPPP, life seemed to be so much of a struggle. “Growing up in the province, I was brought up to believe that life was hard, that it was constant struggle,” she explains. “But after coming to the TOPPP, my outlook in life has changed, especially my concept about money. Now, everything is alright. There is no struggle,” she proclaims enthusiastically. Leila, a bank executive, has been with TOPPP since the late 1980s. She regularly attends the congregation and attributes her excellent health and general well-being to TOPPP. Two of her children join her at the TOPPP. Glenn is a young man who was brought to the TOPPP in January 1997 by his mother. He enjoyed going there. Unknown to people at the TOPPP then, he was an alcoholic. Pretty soon, Glenn got rid of his alcoholism and went to the Middle East to work as a telecom engineer. A couple of months ago, he was back at the TOPPP celebrating his birthday. Consuelo, a businesswoman, joined the TOPPP recently. She said she is seeking answers, and has joined other spiritual groups. She said that after joining the TOPPP, the “manifestations” came in immediately. Her grandfather’s properties were not titled and there seemed to be some obstructions. After joining the TOPPP, she got the titles for five of the properties and even found buyers for them. “What I like about the TOPPP,” she says, “is that the people here do not mind other people’s business.” Apparently, in a “spiritual” group she joined before, other people maliciously poked their noses into each other’s lives and even criticized each other’s clothes or actions. The format is reader-friendly, even for children and the elderly. Each concept is explained in 3 to 4 pages, with illustrations. And the fonts are big. The book is designed like a handbook or manual so that it can be consulted anytime. 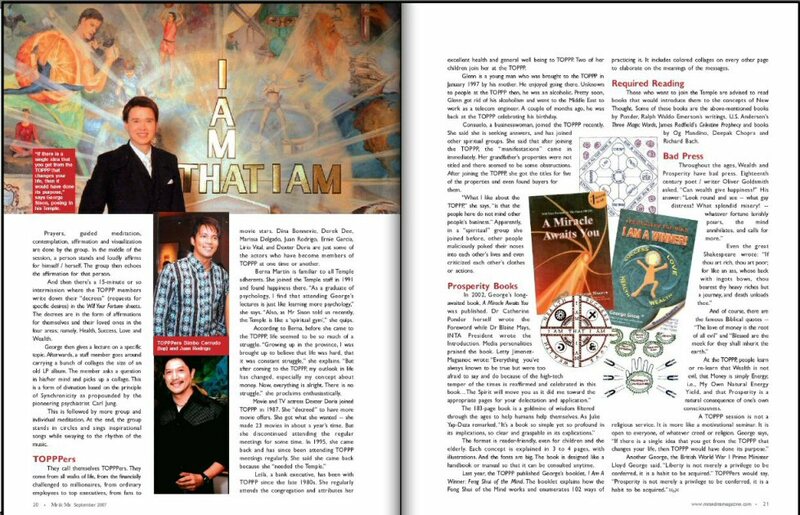 Last year, the TOPPP published George’s booklet I Am A Winner: Feng Shui of the Mind. The booklet explains how the Feng Shui of the Mind works and enumerates 102 ways of practicing it. It includes colored collages on every other page to elaborate on the meanings of the messages. Those who want to join the Temple are advised to read books that would introduce them to the concepts of New Thought. Some of these books are: the above-mentioned books by Ponder, Ralph Waldo Emerson’s writings, U.S. Andersen’s Three Magic Words, James Redfield’s Celestine Prophecy and books by Og Mandino, Deepak Chopra and Richard Bach. At the TOPPP, people learn or re-learn that Wealth is not evil, that Money is simply Energy; i.e., My Own Natural Energy Yield, and that Prosperity is a natural consequence of one’s own consciousness. Previous postIN regard to or WITH regard to?